I'm down to just one quilting bee presently, which is good for now, taking a break, finishing up projects of my own. The problem is I forget to show what blocks I have made! That being said, here are the blocks that I made for February and March. If you haven't seen this type of block, where have you been hiding? The Scrappy Trip Around the World, tutorial found HERE was all the rage late last year in the online quilting community. Though I didn't participate when everyone was making these quilts, I can now say that I have made the blocks, and I do enjoy them, a very clever method of constructing a quilt block. These blocks were constructed a tad differently with 3" strips instead of 2.5", so the finished size is much larger. These are for Hettie K in Always Bee Learning and were shipped off to her quite some time ago. I certainly love all that Anna Maria Horner fabric! The month of March ended up being an "open" month and Leanne over at She Can Quilt graciously volunteered to put together a donation quilt for Siblings Together. She chose the Octagonal Orb Block, tutorial found HERE. I can honestly say that pictures do not do these blocks justice. They are stunning and large, and roughly measure 17"x17." They might look complicated, but really aren't, though I will say time consuming. I decided to make two and about halfway through thought, "What in the world have I gotten myself into?" Though I will say that when I sewed that last seam and those centers came together so perfectly, I was darn proud of myself. It doesn't take much to make me happy, obviously. I know I say it a lot, but I can not wait to see what Leanne does with these gorgeous blocks, and I sure hope she likes them too! 1. April - Cosmic Burst Quilt, I don't have any new pictures because I don't want to take away the surprise, but this one is already quilted and just awaiting binding. It should be my first finish. This quilt was carried over from the first quarter, I could have rushed to finish in time, but decided not to stress and just finish it in my own time. 2. April - Two pair of Goodnight, Sweetheart Pajamas from the "Sewing for Boys" book. I did make a tad bit of progress and have the two pair of pajamas cut out and ready to sew. I hope to finish these in conjunction with Kids Clothes Week Spring (April 22-29.) These pajamas are the last thing I will carry over from the first quarter. 3. April - String Blocks! Rachel at Stitched in Color is currently hosting a String Fever Event, so these blocks moved up on my list. You just have to have a finished quilt top, so really that is all I am aiming for, but having it totally finished would be great! I have a plan for these and am excited to get it laid out. These blocks were from a bee and have been dragging around for about two years. Crazy! 4. May - Wonky star blocks from a bee that I was in last year, these haven't been hanging around that long but the quilt will be for a special someone later this year, so I really want to get it done ahead of time. I am possibly thinking of turning these on point and maybe adding in some larger wonky stars, I guess we shall see. 5. May - Bloom Bloom Pow, a quilt I started last quarter, this quilt-along wraps up in May, so I would like to finish on the same time schedule. Right now I am currently piecing this one! I love all that Flea Market Fancy Legacy! 6. May - Strings Christmas Quilt, yes, I have two uncompleted string quilts. I may try and get the top done on this one to enter into Stitched in Color's contest. This is my big "maybe" project, but at least if I can get the top done, then I can just quilt it around Christmas time. I only have 12 blocks finished, so unfortunately I think I have a lot more work to do with this one. The odds of this one getting "finished" this quarter are slim to none, but heck, why not throw it in there. 7. June - Y Seams Quilt, this is another Christmas present later this year, I have 12 completed blocks from a bee round last year. This will be a throw quilt. I am still debating as to if I will make more blocks or add in solid hexagons in between. Who knows? I can't wait to see how it will materialize, I love these blocks so much. 8. June - Dancing Stars Table Runner, started in January, I currently have 6 blocks done (I think?) and need to have 14 total. I can only tolerate paper piecing in small doses, so a few blocks each month, hopefully by June I can wrap this one up. All the fabric is cut out, just have to piece it. 9. June - Oh these postage stamp blocks have been hanging around for a while, and recently I found another Flickr swap, swapping more of these blocks, so I joined in and just finished up making 30 more. 20 to swap and 10 to keep. Currently I have 20 blocks and after the swap I should have 40, which I believe will be enough to put this quilt together. This one is last on my list because I'm not sure when the swap will wrap up and blocks will be received, but if I can, I would love to finish it this quarter! I know this list is totally ambitious and maybe not possible, for me anyway, but it feels good to put them all out there and see what I can actually get done! 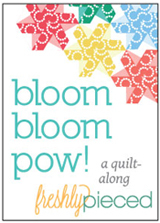 I decided to join the Bloom Bloom Pow Quilt-Along hosted by Freshly Pieced. As soon as I saw the pattern I knew I wanted to make that quilt! I also knew that I wanted to use fabric totally from my stash. So I started digging and stumbled across some hoarded Flea Market Fancy Legacy by Denyse Schmidt. Oh I love the colors in this collection. I also added two prints that aren't from that collection, but ones that I love and match, I figured, why not? So I pulled out the stack, set it aside and waited for the first post about design strategy. Once Lee had posted the first step about design, which primarily took advantage of light, medium and dark fabrics, I realized that wasn't exactly going to work for me. This line of fabrics is primarily mediums with some slightly darker prints, but nothing stood out as light. So then I started rethinking things. Determined to use this fabric, I decided to stick with it for the main petals, and for the lighter background part of the petal, I decided to use solids, and in most of the cases solids that were slightly lighter. I know going into it that the quilt won't exactly have the same effect, but I am hoping that it will create its own unique take on the pattern. This past week, Lee posted the cutting instructions, so I took the time this weekend to cut it all out! Oh my, it took way longer than I thought it would, but I am happy to say that I am done and ready for the next post this Thursday! This is the first time participating in a quilt-along that I have actually been keeping up each week, which is really fun and I'm really excited to start piecing this week! I also did something that is rare for me, I thought ahead to the backing fabric and when one of the online stores recently marked down fabrics to $3.00 a yard, I ordered enough of the above print (praying that it matched) for the backing! I am happy to say that it does match and I really think it is a beautiful print. One of those that looks so much prettier in person than on the screen. A few weeks ago I stumbled across a blog post by Rachel of Stitched in Color announcing a contest using the fabric Shelburne Falls by Denyse Schmidt. The contest was to use at least one print from the collection and make anything you want. I took a look at the fabrics, which by the way is a beautiful collection, and chose a print that would easily work for my little baby boy, who isn't really a baby anymore, but rather a big ole' toddler. Once I ordered and received the fabric, I went to our local fabric store and found a nice linen and a zipper that coordinated beautifully. I had a pattern in mind the whole time, one that I have owned for a few years and never used, Simplicity 2264. Opposite to many in blog land, I am actually a big fan of the major name pattern companies. I learned and grew up using them, so I never have had a problem with them in general, with the exception of a few over the years, heck, everyone makes mistakes. Too bad this was one of them. Nothing was wrong with the pattern itself, but rather the instructions or manner in which they wanted you to construct this fairly straight forward baby romper. My main complaint being that in the pattern instructions, they had the ends of the zipper tape totally exposed in the back neckline. Who wants their precious baby to have those darn rough tape ends rubbing on the back of their neck? Not me! Thankfully, I have enough sewing experience to know how to remedy that and rather enclosed the zipper tape ends into the bias tape binding that you can see in the above photo. I wasn't too happy with that treatment either, and would have preferred regular facings, so next time I will probably do that instead. The zipper installation was odd, doable, but odd, and the leg band installation was far from perfect too, not my fault, but rather the weird instructions. Even with the faulty instructions, you can totally make a great little romper with the pattern, I just think the pattern could have been written better and with a baby in mind. I do think in the end that it turned out pretty precious, and my older son referred to it as a "gentle dandy outfit, that he did not want to wear." Obviously I found this hysterical. I love the little details of this romper and instead of doing an applique (like the pattern called for) on the front pocket, I used three little simple buttons. It has a long zipper in the back for easy dressing and snap tape in the crotch for easy access diaper changing. This was my first time using snap tape, and I will admit it was pretty wonderful. I might be a convert. It is rather expensive, but I used my JoAnn coupon and got 50% off, so then it was more reasonably priced. It was so nice and easy to just stitch on those snaps rather than installing them all afterwards with a hammer. I had every intention of this little outfit being for my son to wear on Easter day, but alas it was way too unseasonably chilly, so instead I am saving it for him to wear this summer. I can't wait to see him running around in it! It is a little large, but I am happy that he will get quite a bit of use out of it during the year. This is my entry into the Shelburne Falls Contest hosted by Stitched in Color. Go visit the entry page and you will see quite a few beautiful projects! Yes, I am aware that we are already in April, but honestly I finished this one almost two months ago. If I would actually spend the time to blog, I have enough photos and projects that I could literally blog for one month straight. Oh well, it is what it is. Back in January I posted my goals for the first quarter of the year, which you can find HERE. My main goal for the year is to finish one work in progress quilt a month. I am happy to say at this point that I am 2 for 3, kinda. These two table runners were January's goal. February's quilt just didn't happen, and probably won't for a while, I'm stumped and aggravated with it, so it is going back in the cabinet. March's quilt is all quilted, and ready for binding, I have decided not to rush to finish it up, but rather take my time and do it right, so it will carry on to the next quarter. I actually am pretty proud of myself, and so excited to keep going. These two table runners are the result of blocks that I received as part of the Scrapbuster Swap over at Flickr quite a while ago. I made 10 wonky star blocks, 5 with a white background, 5 that feature white stars, I mailed them off, the host swapped them, and voila I received 10 blocks back! So technically, none of these blocks are actually made by me. I decided to piece them together into two table runners, both of which will be Christmas presents later this year. I used stash for the backing and binding of one, and ordered a yard of clearance fabric for the back of the other. I free motion quilted both of them in simple stippling. Honestly, I love free motion quilting, I think it is my favorite thing to do, especially with a nice laid back simple design. I quilted both of these table runners in one hour. How cool is that! Once they were quilted, I trimmed them up and added binding. All done! Both measure 12" x 60." 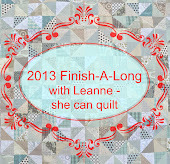 This is my only official finish of the first quarter of the 2013 Finish-A-Long hosted by Leanne at She Can Quilt. Maybe next quarter I will have more to share! 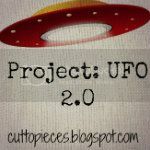 I am also participating in 2013 the Year of the Finished Project hosted by Never too Hot to Stitch and Project: UFO 2.0 hosted by Cut to Pieces. Both of these are great monthly motivators! It is never to late to join in!